His 51 years of retirement stands as a tie for the SDPD record with Detective Lieutenant George Churchman. To pay tribute for his work, on January 28, 2002, the San Diego Police Historical Association, in partnership with the Freemasons Blackmer lodge dedicated a granite monument at the pistol range in his honor. Chief Bejarano and Executive Assistant Chief John Welter were at the event and praised Pease for the more than fifty people in attendance. When Rodney Pease died at the age of 99 on June 6, 2001, few active duty officers remembered him. Not surprising considering he had retired from the department more than fifty years before. Despite not knowing Pease personally, every SDPD officer for more than a half-century benefited from what he had done. Pease almost single handedly built the police pistol range where they learned to shoot. 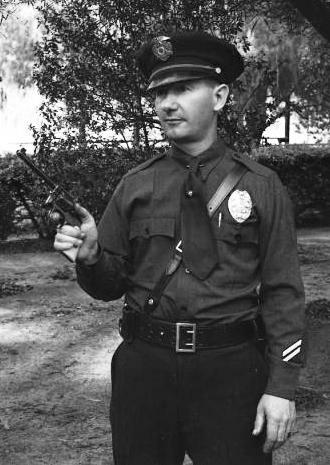 Pease was hired on the SDPD a custodian in 1930. In 1934 he was promoted to range master and given the responsibility of teaching police officers to shoot. It was a good move for both parties. At the time there was no formal firearms training although several new officers reported learning how to shoot by having a senior officer set tin cans on a back fence and having the newer officer shoot them off. As a world champion pistol shooter, Pease was the perfect man for the job. The range Pease envisioned consisted of a firing line and several buildings to be used as classrooms and an armory. He first secured a donation of a parcel of land from the Fenton family in a remote area several miles east of downtown. For building materials, Pease collected stones from a nearby river. Once he had collected enough rocks, he then went to Balboa Park and made deals for excess lumber from the Pan American Exposition. In exchange for the building materials, Pease gave free shooting lessons. Once he had his materials, Pease and a crew of jail trustees began construction. The men worked for several months until finally a pistol range emerged. In 1950 Pease retired and went into the property management business. The range he built still stands as solid as ever in the now heavily populated area of Home Avenue and Highway 94.